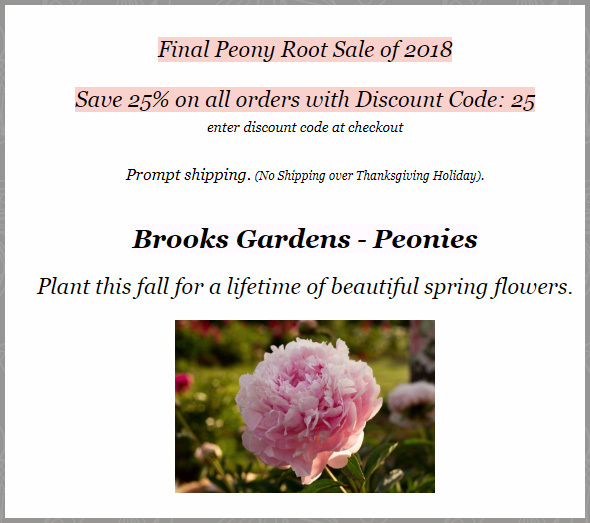 If you just *need* one more root (or a few) to sneak into your garden beds before spring hits, Brook Gardens appears to be having a great "final sale" to close out their season - 25% off everything. It looks like their Final Peony Root Sale of 2018 will last through the end of November, but there's not much time left in November. So you need to make up your mind quickly before the sale is over. One thing that's great about having a more Southern peony garden is that your ground is not yet frozen (unlike some of our Northern neighbors), so we definitely have the opportunity to take advantage of these last minute peony sales and still have time to get them planted this year.